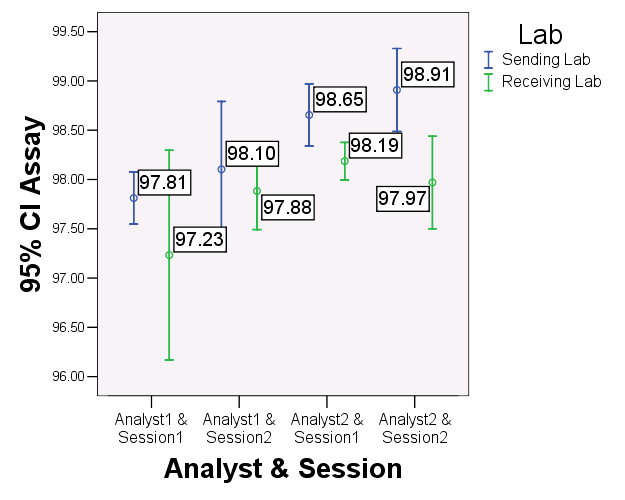 The total error approach is a statistical technique for assessing performance of analytical methods. It could be used for any lab data analysis in oncology or other clinical trials or for the testing of new drugs. Due to variable parameters involved in inter-laboratory transfer of clinical trials like analysts, instruments, day/sessions and geographic location, there are chances of different assignable and non-assignable causes of variations. Here, the statistical analysis of measurement processes helps to identify and quantify sources of variation. 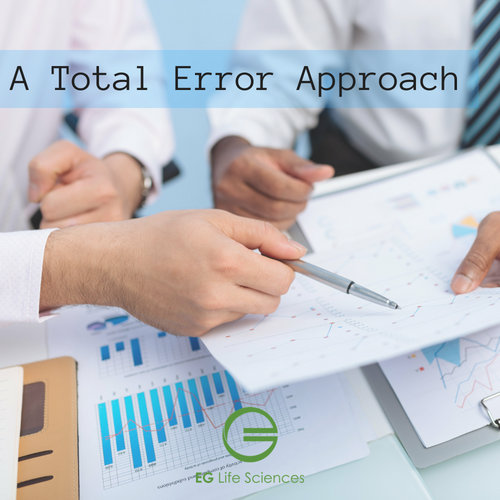 The total error approach evaluates the variability in the parameters and helps the scientist in decision making. Method validation is the process used to confirm that the analytical procedure employed for a specific test is suitable for its intended use. Results from method validation can be used to judge the quality, reliability and consistency of analytical results. Similarly, an analytical transfer is a process that consists in transferring a validated analytical method from a sending laboratory (called Originator) to a receiving laboratory (called Receiver) after having experimentally demonstrated that both labs perform similar methods. This is very useful if you may have to rely on labs that are based at different geographic locations for better cost management. The total error approach calculates the standard deviation for repeatability, session component, intermediate precision and the mean of the lab. 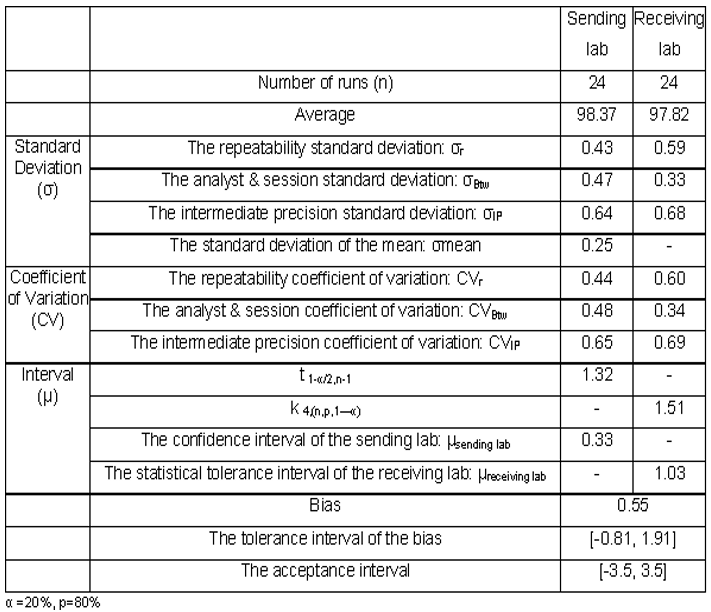 The confidence Intervals of the mean of the Originator lab and statistical tolerance interval of the results of the Receiving lab are evaluated with the risk parameters. Then the tolerance interval of the bias is estimated and tested with the acceptance interval which is set a priori. A successful method transfer is when the tolerance interval of the bias is totally included in the acceptance interval. Typical acceptance criteria for analytical methods are not chosen with regard to the concept of method suitability and are commonly based on ad-hoc rules. Such approaches yield unknown and uncontrolled risks of accepting unsuitable analytical methods and rejecting suitable analytical methods. This article proposes a formal statistical framework for the validation of analytical methods, which incorporates the use of total error and controls the risks of incorrect decision-making. The tolerance interval of the bias [-0.81, 1.91] is included in the acceptance interval [-3.5, 3.5]. 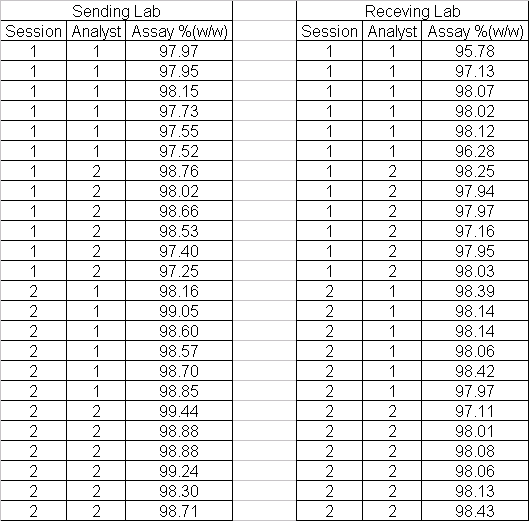 Hence, analytical method transfer from sending lab to receiving lab is successful.